"An Independent Will" is an exhibition at the Morgan Library and Museum, marking the two hundredth anniversary of the unforgettable Charlotte Brontë's name day. This exhibition features personal artifacts, literary manuscripts, drawings, rare printed books, intimate letters, a dress and pair of shoes worn by Charlotte herself. Here I share with you some of my favorite works and historical pieces from the Brontë era. To you I am neither Man nor Woman- I come before you as an Author only- it is the sole standard by which you have a right to judge me- the sole ground on which I accept your judgement. This drawing was found tucked inside Charlotte's school atlas, and it may be her own work. It depicts a stone cross- one of several that dot the West Yorkshire moors, windswept expanses that erupt in purple when the heather blooms in late summer. Haworth parsonage, the Brontë's home, faced the church and village, while the rear of the house looked onto open moorland. The children took frequent rambles across the dramatic landscape that Emily Brontë would conjure so memorably in Wuthering Heights. Framed ambrotype of Haworth parsonage circa 1850. This is the earliest surviving manuscript by Charlotte Brontë, a miniature handmade book of sixteen pages bound in a scrap of decorative wallpaper and illustrated with tiny watercolors circa 1858. (The leather folder was added later.) Charlotte was about twelve when she wrote the story for her sister Anne, who was four years younger. It describes a journey that begins with the child's visit to a splendid castle near London and ends, poignantly enough, as tends to her ailing mother "with so much care." Seventeen-year-old Brontë depicted the fictional character Zenobia, an accomplished scholar of the imaginary Glass Town, with scroll in hand before an impressive row of books. In one of Brontë's early stories, the marquis of Douro defends Zenobia before a group of gossiping men: "You are certainly jealous because a human being of the feminine gender has displayed such wonderful abilities, the sun whose genius.. appears likely to pale the ineffectual fires of her male contemporaries." Brontë was thirteen years old when she copied this rustic scene- with it's driving rain, palpable wind, and ruined castle- from a wood-engraved vignette in Bewick's History of British Birds. Over a decade later, as she wrote the opening pages of her novel Jane Eyre, Brontë placed her young protagonist behind a scarlet curtain, alternating between glimpses into Bewick's book and out a window at the wet and misty world, with its "ceaseless rain sweeping away wildly before a long and lamentable blast." 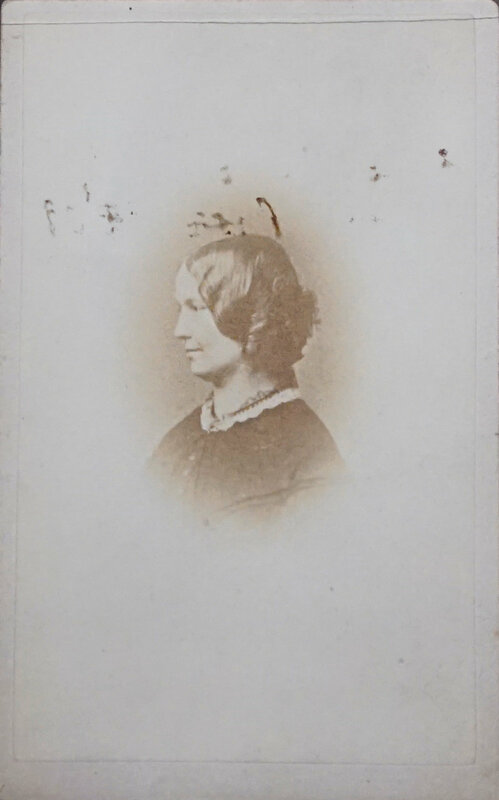 Since this photograph was discovered in the 1980's, many people have hoped to confirm that is the only surviving photographic likeness of Charlotte Brontë. It is, after all, marked on the verso Within a year of CB's death, apparently in the hand of Brontë's close friend Ellen Nussey, to whom many letters are addressed. But the woman depicted bears a strong resemblance to Nussey herself, who may simply have been noting that she had her own photograph taken within a year of her friend's death. Brontë largely abandoned drawing as it became clear that she would neither succeed as an artist nor thrive as a governess, but she continued to produce practical designs like this pattern for an embroidered dress collar circa 1840. It was found in her portable writing desk, along with a lock of her sister Anne's hair, watercolor designs for wallpaper, and a similar drawing for cuffs and a coin purse. Brontë's hinged box opens flat to produce a sloped, velvet-covered surface suitable for writing letter (or composing novels). It was compact enough to set up on the dining room table or pack for use while traveling. Compartments provided storage space for her writing tools, which included inkwells, pen shafts and nibs, sealing wax, and an ivory-handled seal. She kept a plentiful supply of wafers- adhesive discs used as an alternate means of sealing letters. The heavily ruled sheet of paper was a tool for keeping her handwritten lines straight and evenly spaced: she would simply slip it behind her writing paper and follow guidelines. In 1846, Brontë made this copy of her first novel, based heavily on her time in Brussels, and signed the first page with her pseudonym. She affixed a small slip of paper over an earlier title (The Master), packed up the manuscript, and began sending it to prospective publishers. After a year of rejections, she received an encouraging reply from twenty-three-year-old George Smith, who had recently begun to manage his father's London firm. He declined The Professor but would be happy to consider a three-volume novel from the pen of "Currer Bell". Soon after, he recieved- and accepted- the manuscript of Jane Eyre. Smith finally published The Professor in 1857, two years after Brontë's death. Brontë filled her portable oak paintbox with the essential tools of a middle-class-amateur artist. It contains twenty-three cakes of soluble watercolor in a variety of hues. To produce paint, Brontë would dip the cake in wake and rub it onto one of the porcelain saucers. One of her hog's-hair brushes is fitted to a quill. The symbol on the unused cakes- three ostrich feathers rising through a coronet- is the heraldic badge of the Prince of Wales and the trademark of the supplier, or colorman, George Blackman. His trade card, which advertises his services as a "Superfine Colour Preparer," is adhered to the inside of the lid along with a copy of testimonial from the Society for the Encouragement of Arts, Manufactures and Commerce (known today as the RSA). Branwell Brontë was about seventeen when he began this unfinished portrait, depicting his teenage sisters over a decade before they published the novels that made them famous. During the 1950's, infrared photography confirmed the presence of fourth figure- presumably a self-portrait that Branwell had chosen to efface- beneath the central pillar. As the oil paint has faded over time, the ghostly image has become ever more apparent to the naked eye. The painting's condition reflects its history. Arthur Bell Nicholls, Charlotte's widower, took the work from Haworth parsonage to his new home in Banagher, Ireland, after Patrick Brontë's death. In 1914, Nicholls's second wife, Mary Ann, discovered the painting on top of a wardrobe in their farmhouse, where it had apparently lain folded for over fifty year. It was acquired by the National Portrait Gallery that year and placed on display to the public's great fascination. A century later, it is on view for the first time in North America. Brontë was about 4 feet 9 inches tall with an 18 1/2-inch waist (when corseted). She acquired this day dress around 1850, when she was in her mid-thirties, and likely wore it in London that June when she spent a morning conversing with fellow novelist William Makepeace Thackeray. In 1850, publisher George Smith commissioned this portrait of his celebrated author as a gift for her father, Patrick. Sitting for a professional artist was traumatic for the self-conscious Brontë, but none of her discomfort is evident in George Richmond's graceful rendering. This is the only professional portrait for which she sat during her lifetime and the only surviving life portrait except for her brother Branwell's painting of his sisters. The portrait hung in the dinning room of Haworth parsonage during Patrick Brontë's lifetime, and an engraving of the work served as the frontis-piece to the first volume of Elizabeth Gaskell's 1857 Life of Charlotte Brontë. It has appeared in countless studies of the Brontë's since then and is on view in North America for the first time. I am no bird, and no net ensnares me: I am a free human being with an independent will; which I now exert to leave you.